Singapore is an expensive city to spend time in as a tourist, but you can trim some fat from your budget when it comes to meal time. Thanks to the city’s abundant hawker centres, you can get three square meals for around S$10 without sacrificing taste or variety. 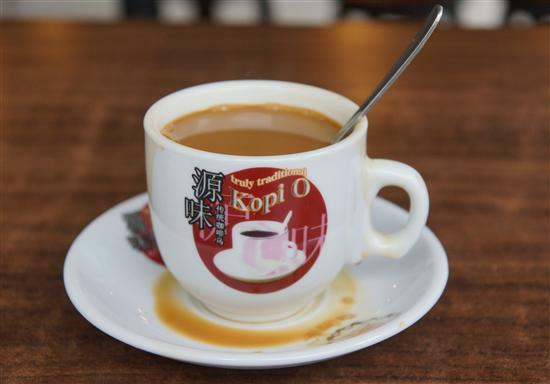 Start the day with a hot cup of kopi. They say breakfast is the most important meal of the day, so start off with a high-calorie meal of kaya toast (toasted bread slathered with margarine and coconut jam) and Singapore-style coffee sweetened with condensed milk. This hearty breakfast will set you back about S$2.50 at most hawker centres or around S$3 at cafes like Killiney Kopitiam. If you’re a light eater in the morning, hawker centre stalls selling coffee and tea also sell snacks like steamed buns and curry puffs for S$0.50–$1.00 apiece. 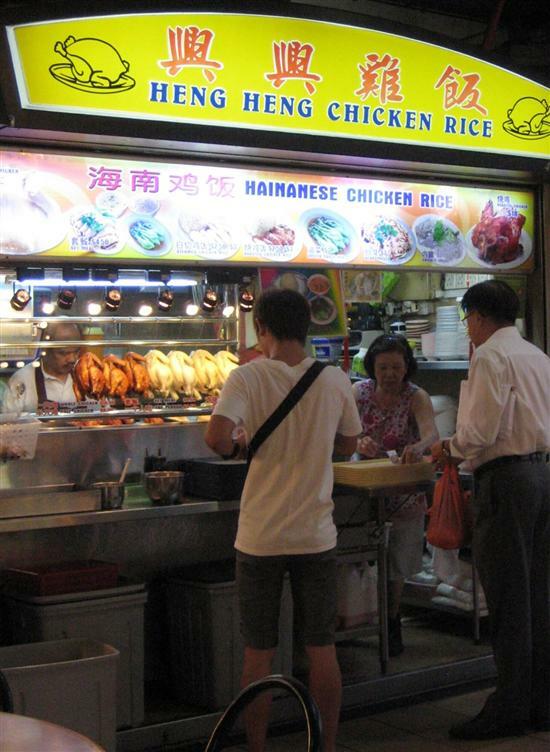 Every hawker centre has a chicken rice stall. Lunch is when you find the greatest variety at hawker centres, with dozens of choices in the S$2.50-3.50 range. “Economic Rice” stalls sell a variety of pre-cooked foods and are just as cheap as the name suggests — around S$2.50 for steamed rice with your choice of one meat and one vegetable dish. Expect simple Chinese fare like sweet and sour pork, tofu and stir-fried veggies. This is also a good option for vegetarians. Another popular lunchtime meal is chicken rice, which is practically Singapore’s national dish. For around S$3 you get a complete meal with roasted or steamed chicken, white rice and a bowl of soup broth. It may sound boring, but when you add the garlic chilli sauce it’s quite yummy. If you prefer pork over chicken, look for a Cantonese roast meat stall — they’ll sell pork rice for around the same price. If you’ve stuck to your budget, that leaves you with about S$4.50 for dinner. Obviously you won’t be feasting on chilli crab for this price, but you can satisfy a seafood craving with a bowl of laksa or a plate of char kway teow. 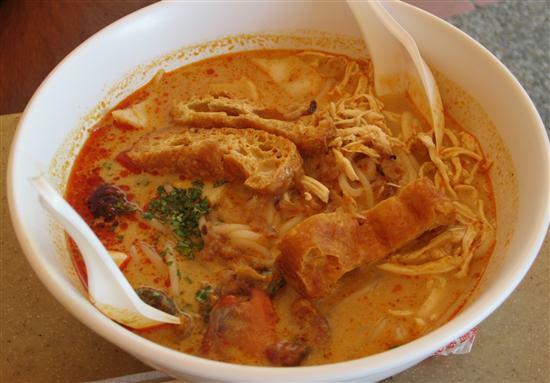 Laksa is a spicy soup with a thick coconut milk broth, noodles, fish cake and plump prawns, while char kway teow is a high-fat fry-up of rice noodles, cockles, prawns and Chinese sausage. Both are delicious and cost around S$4. This spicy bowl of seafood laksa could be yours for just S$4. Many dinner-time hawker dishes are meant to be shared, so if you can get a small group together you could share a meal of satay (skewers of grilled meat with peanut sauce), Singapore-style carrot cake (a stir-fry of rice flour dough, radish and egg that’s more delicious than it sounds) and rojak (spicy fruit salad) and stay within budget. Unfortunately sticking to this budget means that alcohol is completely out of the question. Even though hawker centres are by far the cheapest placse in Singapore for a beer, a bottle of Tiger will be equal to half your entire food budget for the day. While Singapore’s tap water is potable, sadly hawker stalls don’t provide free water — expect to pay S$1.20 for a bottle of water. You could get around this by buying your first bottle and refilling it during your trip.